Alt-Tab Terminator is the direct successor to VistaSwitcher and TaskSwitchXP. 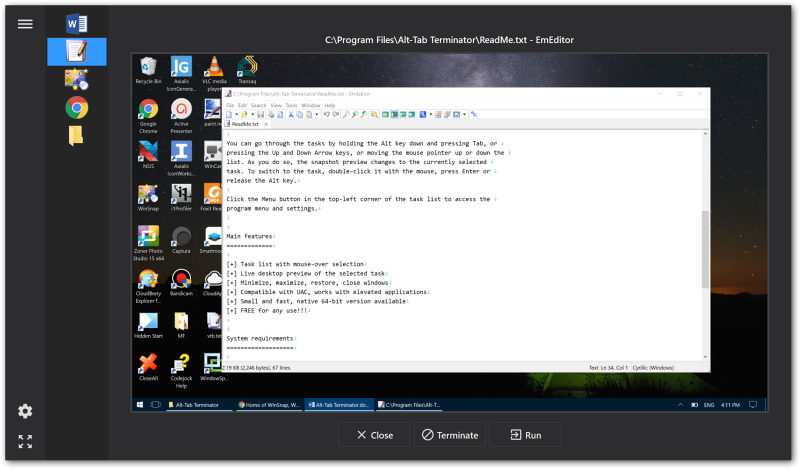 Unlike to the standard Alt-Tab, it shows a live desktop preview of the selected application and an easy-to-read relevant list of tasks with titled icons so you can find the one you need immediately at a glance. Alt-Tab Terminator works with 32-bit and 64-bit applications, even if you run them with administrative privileges. It also supports high DPI and modern Metro apps on Windows 10.